Fleet managers make sure that all merchandises are shipped within the schedule. But, unexpected hardware issues, such as keyboard button failure due to prolonged use, can incur delays. To help them accomplish this task timely, they use industrial computer keyboards in fleet management operations. Amongst the most recommended peripherals is the 96-key rugged industrial keyboard which stands out as one of the best rated in both quality and reliability. It features mechanical key buttons enclosed in a stainless-steel construction. Rated IP67K and NEMA 4 sealed, this design prevents dust and water from damaging the device. So, how can a fleet manager maximise their work efficiency using the 96-key ruggedised keyboard? Find out more on this blog about the benefits of installing industrial keyboards to panel PCs in cargo shipping operations. Modern shipping operations are comprised of multiple networks bearing a complex system. That is why operators utilise rugged PCs to manage and streamline the shipment process. But, there will always be an instance when a technical issue arises which can affect the entire operation. Therefore, integrating industrial keyboards with embedded PCs is an ideal computing solution. Fortunately, the 96-key rugged keyboard is designed to function in environments with extreme working conditions. In fact, its IP67 protection rating and corrosion resistant steel build provide excellent functionality for extended periods. Furthermore, it has an approximate lifespan of 1 million switch cycles. So, expect that this device will operate optimally for several years. This peripheral device also hosts several key features which can benefit the fleet management system. So, check out the top 3 advantages of installing the compatible, 96-key keyboards to industrial PCs. Embedding industrial-grade keyboards to panel PCs for logistics applications can help operators maximise their productivity. Minor delays due to hardware issues can also be avoided. 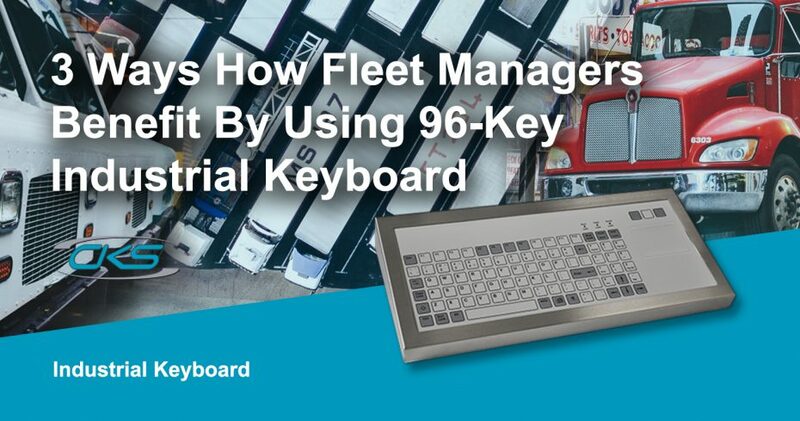 Here’s what fleet managers can expect from using the 96-key keyboard for logistics operations. Unlike common silicone or rubber keyboards, mechanical keyboards have a more tactile feedback [How to Geek]. Its design and key spacing help reduce key sticking issues. This makes it easier for fleet operators to input commands without worrying about the stuck keys. The 96-key industrial-grade keyboard can also come in a case, bezel, rear or flush mounting. These options allow the device to be installed in areas where there is limited space available. Thus, ensuring that fleet operators can easily access this peripheral in key locations across the area. This computer peripheral device also comes with a fully customisable key operation. It can be programmed to fit the fleet management software’s requirements. So, fleet operators can use a keyboard with all the functions needed for streamline operations. Keeping up with the customer demand for fast and efficient shipping means utilising industrial-grade computing equipment to optimise the fleet management logistics system. Since these operations bear strict deadlines and quotas, fleet managers must use accurate keyboards to issue the right commands. So, embed the 96-key rugged industrial keyboard to panel PCs to maximise fleet management operations.